The weather is colder. In some places, snow or rain may fall from the sky. Daylight is shorter. Sometimes it is still dark when we get up in the morning. Along with a variety of special winter activity sports. Let’s talk about WINTER! Some trees lose their leaves in the winter. Other plants seem to disappear during the winter months. Animals undergo many changes. Their coats thicken to protect them from the cold weather. Many birds migrate to warmer climates, other animals store food to have abundance in the winter months. We wear different types of clothing during the winter months. In many places the children play indoors more during the winter. Encourage children to name other changes. I’m a little snow person, Short and fat. When the snow comes out, I cannot stay. In the air. In the air. Here and there. Here and there. I’m made of snow, this is true. I just cannot sit all day. They never make a sound! When it is mitten weather. Then your left foot keep it dry! Watch your step, or you might slip. I think cold is very nice. I think ice is very nice. Sleep, sleep, snooze;, Sleep, sleep, snooze. Other verses: Mrs. Bear, Mr. Snake, etc. I wonder when he’ll come out, I wonder when he’ll come out? It is dark. It is cold. I am bundled snug and warm. Cut out two pieces of felt into the shape of a mitten. Put Velcro around the sides and leave the top open. Have the children count how many plastic animals fit in the mitten before it burst open. Record how many animals fit in the mitten for each person in the group. 1.) We read two versions of The Mitten (one by Jan Brett and one by Alvin Tresselt ) The children made symmetrical pairs of mittens. We put them on a bulletin board and the children had to find the matching pairs. 2.) Make a huge white mitten out of white fleece. Have stuffed animals or puppets of each animal and put them in the mitten as you tell the story. Once the mouse tickles the bears nose as the bear sneezes, stand up and throw all the animals in the air. The children giggle with glee, and cant quite believe you just threw all those animals in the air. Mix two parts glue to one part water. Dab snowflake shaped sponges into the glue mixture and place onto blue construction paper. Have the children shake glitter on top of their snowflakes. Set aside to dry. Print off my snowman coloring page HERE. Tear a semi-circle out of a styrofoam cup. Decorate the cup with felt-tipped markers to resemble a cave. Glue a brown pom pom inside on the back edge of the cup. Make a brown bear by adding arms, legs, and head with brads. Have the children find a special place until spring. The teacher sends home a note then and reminds them to send them back to school. The children think it is great to find a dark place to let their bear hibernate. Cut a green pepper in half crosswise. Let the children dip the pepper into white paint and press down onto dark colored construction paper. Add glitter or embossing glitter for texture before the paint dries. Mix an equal part of Epsom salts and boiling water together. Mix the mixture well and set aside to cool. Have the children draw with crayons on dark colored construction paper any winter scene of their choice. After the children are finished drawing, paint a light coat of the mixture over the drawing for a frosty appearance. It turns frosty only after drying. Out of newspaper draw a snowperson shape, make sure that you have two shapes when you trace and cut. Let the children decide on the size, within reason. Have the children paint the snow people white be sure to paint both sides. After drying have the children help you staple the two sides together, leave a opening so you can stuff. Stuff the snow person using more paper. Finish stapling the rest of the figure. Add scarves out of scrapes of fabric and put out a variety of other materials for eyes, nose, mouth and buttons. Let the children create their own master pieces. Trace around wallpaper sample books to create large shape mittens. Hole punch around the perimeter of each of them. Lacing around the mitten pattern with yarn. Picture and pattern HERE. This has been the best app I have bought for my kids. My oldest can use this as well as my toddler. I am impressed with the many options available for the games and levels of difficulty. I can see a huge improvement in the way my daughter understands math, her skills have improved tremendously, and her grade has went up in school as well. I sit with my kids while they play most of the time, but they are able to work it on their own. I highly recommend this app for all kids Preschool – 4th grade. It is a great way to practice and drill the facts in a fun way. A+ as usual for 22L. Fill three jellyroll pans with water and freeze the day before this activity is planned. Gather small match-box car, spoons, salt and sand. Have children try to drive the cars over the ice. What Happens? Spoon salt over one sheet of ice and sand over another. What happens when the children try to drive the cars over these surfaces? What implications can be drawn for driving on ice. The kids love this activity. Have parents bring in a variety of hats. Look at the hats with your children and talk about how they are alike and different during group time. Have them guess when each hat is worn. Put the hats in a large box. Let your children take turns sorting the hats into two boxes, one for hats to wear in the summer and one for hats to wear in the winter. You can get my sorting cards to label your boxes HERE. Make play dough ahead of time. Do not add any food coloring- leave it white. Add the playdough to the sensory table along with small pebbles, fabric, sticks, buttons and scarfs. Allow the children to make snow people any way they wish. Cover the bottom of the sensory table with black construction paper. Pour about an inch thick of salt on top of the paper. Have the children make their own winter designs practice, numbers or letters. Ahead of time you will need to cut out ten snowmen from white construction paper. Mount each to tagboard, add scarves, twigs for arms and a hat numbered 1-10. Laminate the snowmen for durability. Provide a container with 55 buttons, have the children decorate the snowmen with corresponding number on hat. Use real mittens. Hang a clothes line with spring loaded clothespins between two chairs. Clip one mitten from each pair onto the clothesline. Put the mitten mates in a bag. Hold up the bag. Have a child come up and pull one mitten out of the bag. Have the child look at the mittens hanging on the clothesline and find the mitten that matches the one that he/she is holding. Have him/her clip it next to the matching one. Continue until all the mittens have been matched. Freeze colored ice cubes have the children paint with these at center time on large pieces of butcher paper. Sit in a circle and pass two ice cubes around as you sing the song. The kids have a great time discovering that ice cube would melt in our warm hands had heat. And yes…you keep singing and passing until those ice cubes disappear! Give each child a Styrofoam ball to carry on a large spoon. Encourage each child to try walking as slowly and they as rapidly as they can without jarring the ball from the spoon. Indoor Snowball Fight? Yes, please. 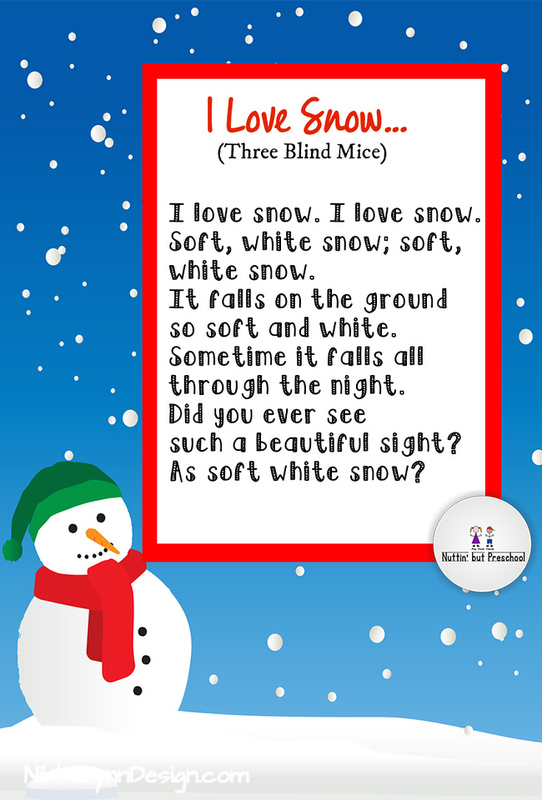 Give children opportunities to toss snowball bean bags into basket. Group children in pairs and provide each pair with a small container and a pile of Styrofoam snowballs. Position a bucket at an appropriate distance from all of the pairs. Ask the partners to work together to fill their container with snowballs and, carry it to the bucket, and empty their container of snowballs into the bucket. Group children in pairs: then provide each pair with a beanbag. Encourage the children to gently throw the snowball beanbag back and forth. Each mitten has a mate, has a mate. Can (child’s name) find the pair? He/She) is looking here and there. Can (child’s name) find the mate. This short book has a few lines of simple text for each two-page illustration about the winter habits of various animals. The author looks at animals like monarch butterflies which fly south, animals that hibernate like the woodchuck, and the animals which continue to forage in the winter like the pika, deer, and mice. Large and beautiful color illustrations on every page of this book—one in a brand-new four-volume series—will appeal especially to early grades boys and girls. Kids will also love having the simply written descriptive text read to them as they gaze at the charming pictures—and as they get just a little older, they’ll be able to read the text by themselves! Both words and pictures evoke the moods and activities of winter, and the illustrations show children at seasonal play. The activities in the back of the book are fun and educational too. A small book for children, particularly pre-schoolers, about a little boy who goes outside to play in the new fallen snow. It shows the simple joy and delight a child can have with newly fallen snow.